Guide-it™ Recombinant Cas9 (Electroporation-Ready)은 Streptococcus pyogenes 유래의 Cas9 재조합 단백질로써 CRISPR/Cas9 gene editing 실험에 사용할 수 있도록 C-terminal nuclear-localization signal (NLS) 변형이 되어 있다. 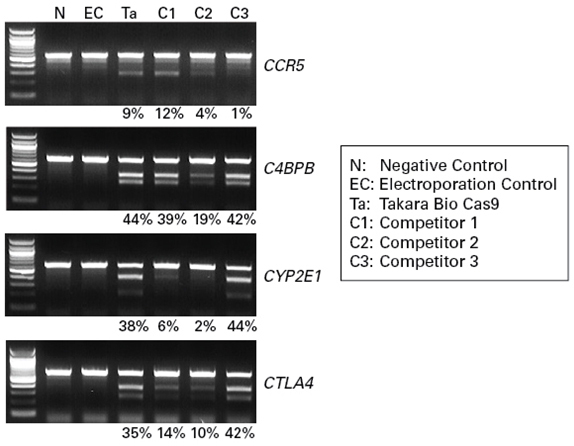 Cas9-sgRNA ribonucleoprotein(RNP) 복합체의 electroporation은 빠른 시간 내 gene editing이 가능하도록 하며, 또한 off-target effect를 최소화 할 수 있다. 그림 1. Gene knockouts in the Cellartis hiPSC-18 cell line. The strength of the cleaved bands gives a semiquantitive estimate of the percentage of edited cells. As can be seen, the Guide-it recombinant Cas9, when combined with sgRNA from the Guide-it In Vitro Transcription Kit, provides consistent and effective gene editing for many targets. Numbers at the bottom of each gel represent gene editing efficiencies (expressed as a %) for the indicated RNPs. 그림 2. 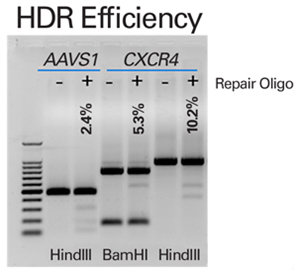 Homology-directed repair at the AAVS1 or CXCR4 genes. A template containing a HindIII restriction site was inserted into the AAVS1 gene, and a template containing both a HindIII and a BamHI restrictrion site was inserted into the CXCR4 gene. Gene targets were then amplified from target cells using PCR and analyzed by restriction digest. Editing efficiencies are shown above each positive well on the gel. The extra band in the BamHI digest of the CXCR4 gene is due to a second BamHI site already present in the wild-type gene before editing. PPIB (Cyclophili B)에 대한 2개의 guide RNA (gRNA)와 Cas9 protein (타사 제품 또는 Guide-it Recombinant Cas9 protein) 복합체 (RNP)를 형성하였다. 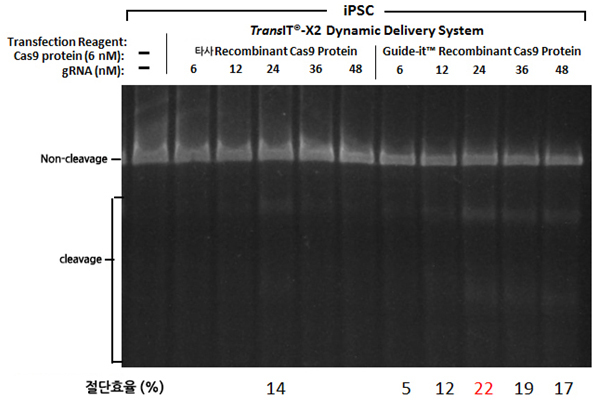 그 후, RNP 복합체를 TransIT-X2 Dynamic Delivery System (Code MIR 6000) (1㎕/well 첨가, 24-well plate, Mirus Bio) 를 이용하여 iPS cell (KOLF-2, Wellcome Trust Sanger Institute)에 Transfection 방식으로 도입하였다. 여러 농도의 guide RNA를 조합한 RNP 복합체 도입 후, T7E1 mismatch detection으로 절단 효율을 확인한 결과 타사 제품 대비하여 보다 높은 절단효율을 확인할 수 있었다.